Poochie, an 8-year-old poodle who suffered a serious weight problem, has lost 11 pounds on her managed fitness program and is living a healthier, happier lifestyle. With spring upon us, everyone’s attention is turning to fitness, and it’s important to remember fitness is important for pets. April is “Canine Fitness Month,” and Auburn University’s College of Veterinary Medicine says now is a time for pet owners to be aware of how to safely introduce increased activity for their pets. “Dog owners need to let their pets return to increased exercise in a safe manner,” says Liz Hodson, a certified canine rehabilitation practitioner and licensed veterinary technician, who leads the Physical Rehabilitation Service at the college’s Wilford and Kate Bailey Small Animal Teaching Hospital. Certified Canine Rahabilitation Practitioner. Liz Hodson, left, and Stephanie Siegwald, a fourth-year veterinary student and Poochie’s adoptive owner take the poodle through some exercise routines. Since starting the Chub Club program, Poochie has dropped 11 pounds and is now able to resume walks and other routine activities that were previously troublesome for her. Dogs may also have put on a little extra weight during winter. Losing that weight—and doing so in a healthy manner—is important, Hodson adds. 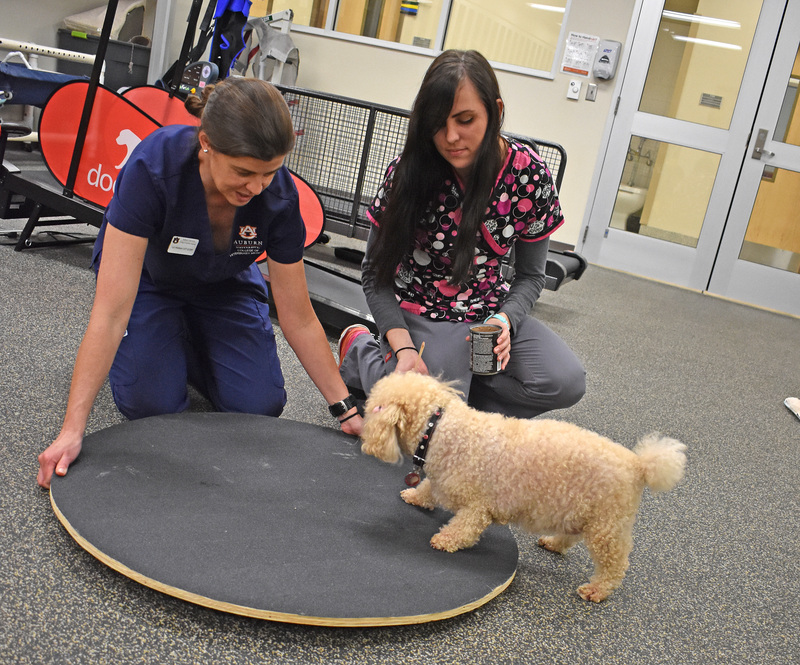 Hodson directs the teaching hospital’s Club Chub program, operated through the Physical Rehabilitation Service, a resource pet owners can use to help manage their dog’s excess weight and put their pet on a diet and exercise program that is safe and healthy. Poochie, an 8-year-old toy poodle, is one of the program’s most recent participants. Poochie had a serious weight problems, and suffered related complications. She was admitted into the Chub Club program last September, but in December, Poochie’s owner became ill and surrendered the poodle to be fostered. “Poochie was a client-owned dog that had been surrendered to the college for foster care when her owner became ill,” said fourth-year veterinary student Stephanie Siegwald of Louisville, Kentucky. Siegwald began fostering Poochie in December and, in February, officially adopted her as her own pet. Since starting the Chub Club program, Poochie has dropped 11 pounds and is now able to resume walks and other routine activities that were previously troublesome for her. Chub Club was launched in 2015 and, since that time, has helped some 20 patients through its regimen of prescribed diet and exercise, according to Hodson. Maintaining adequate hydration is important. Ensure your dog has sufficient water. Dog owners interested in learning more about Chub Club can contact the Physical Rehabilitation Service at the Bailey Small Animal Teaching Hospital.